Dubbed as “bigger than Coachella”, the most exclusive party ever assembled on an exotic, deserted island and that moment when the perfectly curated world of Instagram influencers came crashing down. Hulu and Netflix documentaries have done a great job of reminding us that #FyreFestival was a complete disaster! And that’s putting it lightly. Soggy tents. Sorry-looking salad. Luggage loaded out of a shipping container in the dead of night. No thanks. But how did glamorous online promotion result in such a huge social media backlash? Here’s what #FyreFestival taught us about influencer marketing. A VIP experience on the luxury island of Great Exuma in the Bahamas. Two transformative weekends with celebrity performances from the likes of Blink-182. First-class travel from Miami in a custom Boeing 737. Hindsight is a great thing. But when all those guests rocked up, they had no idea it would be so terrible. And why would they? The event was co-hosted by Ja Rule (you read that right). And organisers had gone to town with influencer marketing, flying celebs to pose on white sandy beaches. Don’t forget! A-list endorsements are huge these days. Millennials hate ads, for instance, but 58% wouldn’t mind seeing an ad with their favourite celeb! Fyre played on this mindset compiling 400 of the world’s biggest personalities to spread the word. 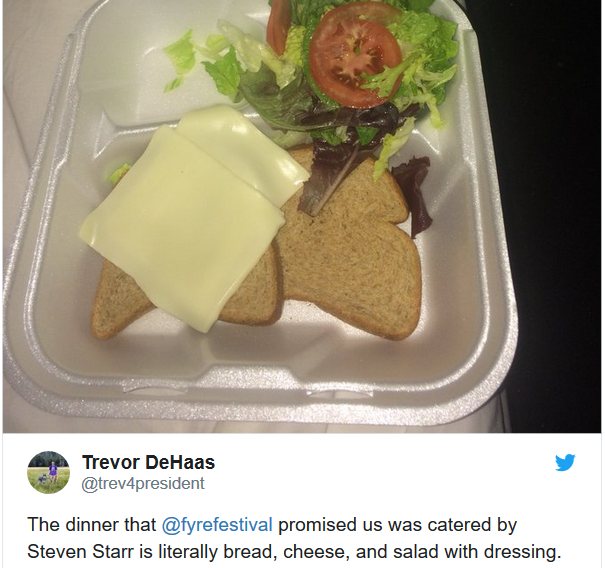 Below is an extract from the Fyre Festival Pitch Deck. But with #FyreFestival quickly going up in flames and organiser Billy McFarland sentenced to six year behind bars and ordered to forfeit $26 million, what can we learn from influencer marketing? The big question is: who’s responsibility is it to tell the truth? It’s a grey area, but ultimately it’s up to the paying client to feed truthful information to the influencer. If the influencer is then in doubt, it’s best for their own interests they stay quiet than put themselves in a litigious position. Individual influencers aren’t usually interested in battling across their social channels with any client. It’s their shop window and as such it would obviously be detrimental to their social persona, commercial currency and future business. The fault was clearly the promoter and their actions in this case. Should influencers, when they know something to be a falsehood, retract their support for the product? In this case, I’d argue ‘yes’. Nothing dies on the internet. We’ve seen that with Trump’s tweets being dragged up to counter arguments he’s making today. You can’t expect your past digital actions, even if they’ve been deleted, to stay hidden amidst controversy. Therefore, the moment an influencer knows they are misleading people they have the responsibility to tell the truth. If not for their followers, but for their own reputations. The Netflix documentary has done an excellent job of educating the public to the dire consequences of acting on shallow promotions peddled by influencers – the majority of whom will say pretty much anything for money. Thought leadership is meant to be about expertise and credibility, but the current state of play is anything but. It’s a racket. Who’s really being influenced here? The answer I suspect is ‘the vulnerable’ and ‘the gullible’ and as such, the influencer industry is on target for implosion. Many would argue influencers can’t be directly to blame for the Fyre saga as they’re not the key decision makers. But should they take more responsibility for their actions? It’s clear that many endorsements aren’t properly researched. After all, if they knew the ins and outs of what was going on would they really want to be associated with such an event. Often, a hefty price tag for a bit of social media activity is enough to get big names on board. Takeaway: Macro influencers can be great for brand awareness and outreach. They have a huge following, after all. But marketing on this level must be done carefully to avoid a backlash. Celebrities need to know what they’re getting into to ensure they’re social media interaction is authentic. Kendall Jenner raked in a whopping $250,000 for a single Instagram post about #FyreFestival. But this single post alone seems to have contributed to how influencers now interact on the platform. What caused alarm? Well, the post was an ad, but it was not tagged in this way meaning people didn’t know she was being paid huge sums for her involvement. Deceptive right? The Federal Trade Commission (FTC) requires influencers to be completely transparent. At the end of 2017, Instagram also rolled out a new partnership feature which lets users instantly see when influencers are working with a brand. Check out the latest fallout for influencers involved in #fyre. Endorsement guidelines also focus around the four Ps. This clampdown got increasingly serious of late with Alexa Chung, Rosie Huntington-Whitely and Rita Ora being among the celebrities responding positively to the UK’s Competition and Markets Authority’s sponsored post guidelines. These include not using ambiguous language such as #sp; #spon; #client and #collab or hiding disclaimers at the bottom of posts. A simple branded hashtag used by influencer can send the media and social networks into an absolute frenzy. 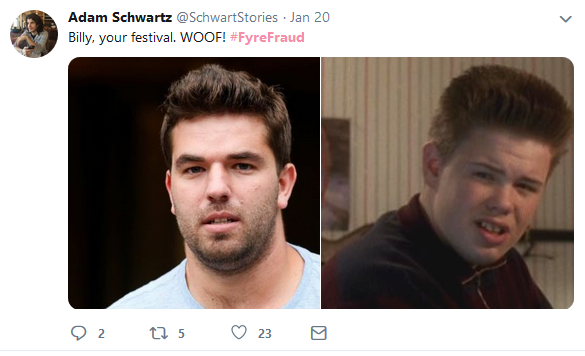 Indeed, to ignite Fyre, 63 influencers simultaneously posted a vague orange coloured graphic to social media with the hashtag #FyreFest garnering over 300 million impressions in 24 hours. Keep in mind, however, that while social media can certainly ‘make’ a project, it can ‘break’ it too with #FyreFraud trending on Twitter. Calling all Home Alone fans! Do you think influencer marketing should carry more responsibility? Tweet us @_Contentworks and let us know your thoughts. Contact the Contentworks crew today to get Socially Sorted. Lights, Camera, Action- How to Prepare for Your Live Video!